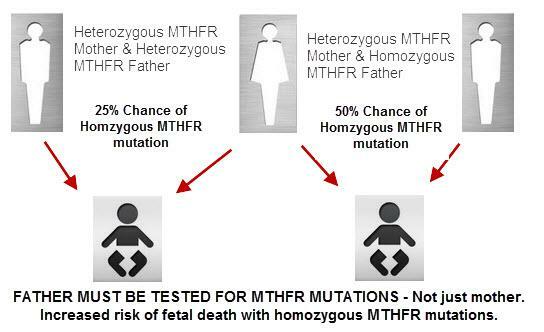 We cannot go overboard about MTHFR gene mutations. It’s just one of many gene mutations possible in the body and comes in mild, moderate and severe presentations. The physiologic problem with MTHFR mutations is lack of methylation and elevating homocysteine is the key point of all that occurring. If the person has a heterozygous gene mutation and without treatment their homocysteine is 7, I’m sorry, but that gene mutation is mild and the body is working fine with it. There is no need to panic the patient and elevate their gene mutation to some nasty alien about to burst out of their chest. It’s under control–look for Obstacles to Cure elsewhere. Even with a homozygous C677 and homocysteine of 21 untreated, if they take folic acid/MTHF and get their homocysteine down to 7, again, the damage is under control and the body is methylating and working fine. The mutation is dealt with successfully and again, no need to do a gloom and doom thing with the patient; just keep them on their supplementation for life. It’s like having hypothyroidism--yeah, not good if left untreated for years, but if the patient is on thyroid medicine and doing great and their TSH/FT3/FT4 are normal, then move on. Don’t keep telling them their thyroid is a problem; it’s not anymore if they take their meds. The problem is we have many patients with gene mutations and elevated homocysteine levels who are undiagnosed, like I was, and walking around for many years with potentially damage occurring to their bodies. Indeed that damage has many studies showing it can affect nearly every part of the body and many biological systems, since methylation is so vital a component of our physiology. So, we just need to catch patients with elevated homocysteine and treat it successfully; then they should do fine. I am not about doom and gloom. It is a passion of mine to educate and inform – and empower. I feel strongly that those who have recurring miscarriages – with heterozygous MTHFR and ‘normal homocyteine’ are being ignored – and there are a LOT of women out there like this. Yes – there may be other reasons for the miscarriage – many other reasons. But when a woman tells me she has been tested for everything under the sun for things and only thing positive is a heterozygous MTHFR, I listen. When another woman says the same thing, my ears are doubly interested. When yet another one says the same story – I really start thinking that something is being missed. My theory is a simple one. Those woman with heterozygous MTHFR and miscarrying may have a partner who is passing on another MTHFR mutation. I am empowering people with MTHFR and helping them get better – I am not instilling fear. All I ask is that we have an open mind beyond what the research is showing. Research is not always right and with MTHFR – it is sparse. Research is needed more in this area. ← Can a homozygous MTHFR gene mutation can be managed by diet alone? What type of “Therapy”? Were you taking betain and b12 as well as l methylfolate? I am compound heterozygous Mthfr and have elevated homocysteine. I am wondering how are your levels since your last post. I have not started treatment yet due to GI issues. Did you have any problems with methylation. New to all this. I stay weak and nauseated. I feel like no one understands these issues related to this mutation. Would appreciate any feed back.